Chabad Youth offers dynamic, creative and educational programs that include trips, outings, sport activities, camping, and Shabbaton weekend retreats. We also create numerous venues for Israel action, volunteerism opportunities, teen aid and community service. Our goal is to raise Jewish awareness and pride, and help our youth appreciate the richness of our beautiful traditions, instilling a heightened level of sensitivity, compassion and communal responsibility, as well as a strong attachment to Israel and all things Jewish. We have a host of programs for children of all ages. Please explore the links above to learn about what Chabad of Mineola has for your child. When it comes to our youth, the Chabad- Lubavitch philosophy is simple: Education is not limited to the hours a child sits in a classroom, but must become a way of life. 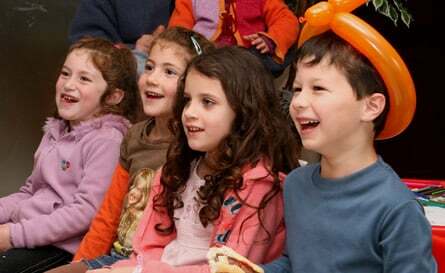 Through an exciting mix of hands-on programming, children in Chabad-Lubavitch educational institutions learn the importance of kindness and good deeds, and experience fun and interactive programs about Jewish history, holidays and practices. In the 1940s, when Chabad-Lubavitch came to the United States, the first order of business was to establish schools and quality educational programs for children, promoting Jewish values, holidays and observances. In 1980, the Lubavitcher Rebbe, Rabbi Menachem Mendel Schneerson, expanded these efforts by establishing “Tzivos Hashem” (“G-d’s Army”), an international network of educational organizations exclusively for children under the age of 13, channeling the natural enthusiasm and sincerity of children to lay the foundation for a Jewish future. Chabad-Lubavitch offers innovative programs—such as model shofar and matzah factories, Lag B’Omer children’s parades, Chanukah theater, and beginner’s Shabbat—to teach children about Jewish history and culture in an interactive and entertaining environment, Today, Chabad-Lubavitch is the largest and most vibrant Jewish youth organization in the world,with more than 91,000 members in North America and over 210,000 members worldwide, all under the age of 13. WELCOME TO OUR NEW YOUTH ZONE! PLEASE BROWSE THIS SECTION TO SEE WHAT WE OFFER OUR YOUTH! Get involved! Contact 516-739-3636 to see our you can be part of our amazing youth programs!